A cluster of stars called the Pleiades. Stars are giant spheres of superhot gas made up mostly of hydrogen and helium. Stars get so hot by burning hydrogen into helium in a process called nuclear fusion. This is what makes them so hot and bright. Our Sun is a star. Birth - Stars start out in giant clouds of dust called nebulae. Gravity forces the dust to bunch together. As more and more dust bunches up, gravity gets stronger and it starts to get hot and becomes a protostar. 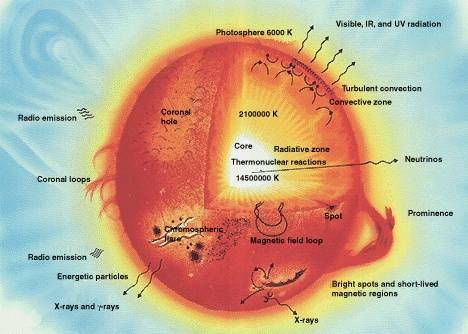 Once the center gets hot enough, nuclear fusion will begin and a young star is born. Main Sequence Star - Once a star, it will continue to burn energy and glow for billions of years. This is the state of the star for the majority of its life and is called the "main sequence". During this time a balance is met between gravity wanting to shrink the star and heat wanting to make it grow bigger. The star will remain this way until it runs out of hydrogen. Red Giant - When the hydrogen runs out, the outside of the star expands and it becomes a red giant. Collapse - Eventually the core of the star will start to make iron. This will cause the star to collapse. What happens to the star next depends on how much mass it had (how big it was). The average star will become a white dwarf star. Larger stars will create a huge nuclear explosion called a supernova. After the supernova it may become a black hole or a neutron star. Stars form from massive clouds of dust called nebulae. There are many different types of stars. Stars that are in their main sequence (normal stars) are categorized by their color. The smallest stars are red and don't give off much of a glow. Medium size stars are yellow, like the Sun. The largest stars are blue and are hugely bright. The larger the main sequence star, the hotter and brighter they are. Dwarfs - Smaller stars are called dwarf stars. Red and yellow stars are generally called dwarfs. A brown dwarf is one that never quite got large enough for nuclear fusion to occur. A white dwarf is the remnants of the collapse of a red giant star. Giants - Giant stars may be main sequence stars like a blue giant, or stars that are expanding like red giants. Some supergiant stars are as big as the entire Solar System! Neutrons - A neutron star is created from the collapse of a giant star. It's very tiny, but very dense. Many stars come in pairs called binary stars. There are some groupings with up to 4 stars. The smaller they are the longer they live. Giant stars are bright, but tend to burn out fast. The nearest star to Earth is Proxima Centauri. 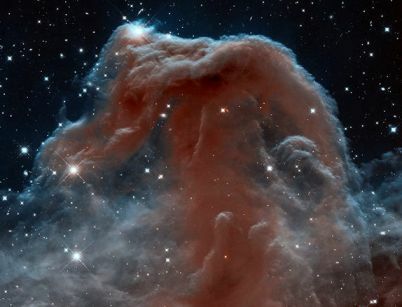 It is 4.2 light-years away, meaning you would have to travel at the speed of light for 4.2 years to get there.